I spent my last week in Singapore with the Carolina Southeast Asia Summer Program doing all of my favorite things one last time and discovering some new favorite things along the way. Thursday afternoon I returned to the Chinese Gardens and climbed a pagoda to overlook beautiful ponds and bridges. I also walked past a series of statues, honoring renowned Chinese historical figureheads, whizzing past the pious Confucius for a quick pic with Hua Mulan, a woman who left her family for 12 years to fight in the Chinese army (and also got a pretty great Disney movie made about her in the process). Friday night we danced our way to the top of a three-tiered stage at Zouk — ranked the ninth-best club in the world — and then awoke the next morning for a spectacular hike through MacRitchie Nature Reserve, where we saw no less than 10 monkeys picnicking on the lawn. And I spent my last day in Singapore at Pulau Ubin — a tiny island just a taxi/ferry ride away and home to an old-fashioned way of life, filled with kampong villages, spectacular biking trails, palm tree vistas, coastal boardwalks and the best chili crab you’ve ever (not) tasted. But Saturday night holds a special place in my heart, as I spent it atop the Marina Bay Sands Hotel, a five-star hotel overlooking Marina Bay Sands. From the rooftop, I watched the sunset over Singapore and reflected on my second visit to the country. And then I was interrupted. First by Apache helicopters swooping overhead. Followed by several rounds of cannon fire. And then by another troupe of jets — this time with one bearing the Singapore flag. Then by the national anthem sung from the multicolored floating platform. And finally by a spectacular burst of fireworks, which split across the night sky in celebration of — wait for it — one of several dress rehearsals for the big National Day Parade next month. If you doubted whether people take National Day seriously in Singapore, think again. They put our 4th of July fireworks and weenie roasts to shame. I had been to the top of the Sands Hotel to watch the sunset with a group of friends last year. And last year when I spoke about my experience in Singapore, I always waxed eloquently about the sight from the rooftop — being able to look out and see most of the country — all of our favorite hangouts: Marina Bay, the Singapore Flyer, the ritzy five-star hotels, the barrage, the Esplanade, and a handful of museums … and if you looked beyond that you could even see the foggy edges of Malaysia and Indonesia. Three countries from the vantage point of a rooftop! But this viewing experience was quite different. First of all, this year we could also see the Gardens by the Bay, the newest addition to the ever-changing city. (The gardens opened the Thursday after we’d left, but our friends back in Singapore called it a must-see attraction and described in detail the solar-powered supertrees, which display over 200,000 plant species from all over the world.) But beyond mere additions, this rooftop view encapsulated more than just a skyline cast in pink and purple hues, for the scenery — the fighter jets and battleships, the cannonballs and fireworks — came to life and gave us a farewell you could find nowhere else. 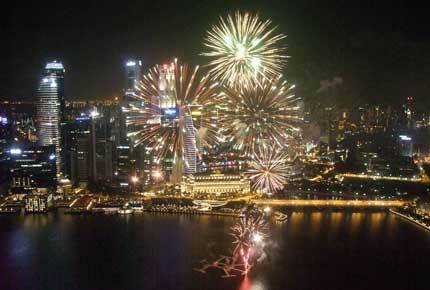 Because like everything else in Singapore, the celebration was perfectly, wonderfully, spectacularly overboard. Several of my friends and I had decided to stay on the rooftop to watch the light show — a fantastic display of what technology and the Singaporean kiasu (or desire to be first) spirit can do with water and light. (Imagine, if you will, watching television on a screen made completely of water vapor and light, all set to a sound score performed by a 140-piece orchestra, and you’ll have an idea of what I’m talking about.) When the light show began sharply at 8 p.m., the chorus was still singing, and halfway through the show, the fireworks started in earnest, so we were torn between three performances. Talk about not knowing where to look! Only we did know where to look. For as the shows came to a close and the watercolor backdrop darkened and the nightlights flickered on, we were drawn not to the city itself but to the reflections in one another’s eyes. And I saw how I had been changed by the city that is always changing.